June 27, 2016 – Today, we jump through the Guardian of Forever and into New York City during the American Revolution — just in time for Independence Day 2016. Once there, we meet twelve-year-old Gabriel Cooper, an orphaned patriot who sets out to join the Continental Army. 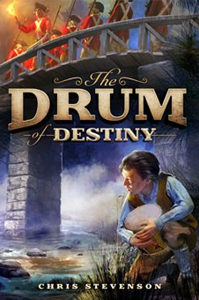 Our guest is Chris Stevenson, and his book is The Drum of Destiny , historical fiction for readers 9-12 years of age. You can find a teacher’s guide at ChrisStevensonAuthor.com, and also on Facebook, Instagram, and Twitter. Chris also hosts a blog that focuses on the Revolution and Colonial period. You can also get the Teaching Guide at Chris’s website.